Habit: Annual, perennial herb generally from rhizomes. Stem: round or flat. Leaf: generally basal; sheath margins fused, or overlapping and generally with 2 ear-like extensions at blade junction; blade round, flat, or vestigial, glabrous or margin hairy. Inflorescence: head-like clusters or flowers 1, variously arranged; bracts subtending inflorescence 2, generally leaf-like; bracts subtending inflorescence branches 1--2, reduced; bractlets subtending flowers generally 1--2, generally translucent. Flower: generally bisexual, radial; sepals and petals similar, persistent, scale-like, green to brown or +- purple-black; stamens generally 3 or 6, anthers linear, persistent; pistil 1, ovary superior, chambers generally 1 or 3, placentas 1 and basal or 3 and axile or parietal, stigmas generally > style. Fruit: capsule, loculicidal. Seed: 3--many, generally with white appendages on 1 or both ends. Genera In Family: 7 genera, 440 species: temperate, arctic, and tropical mountains. Note: Flowers late spring to early fall. Habit: Perennial herb, cespitose or rhizomatous, rhizome ascending or vertical. Stem: cylindric. Leaf: generally basal, cauline few; blades linear, flat or channeled, margins and sheath opening, sparsely to densely long-soft-hairy. 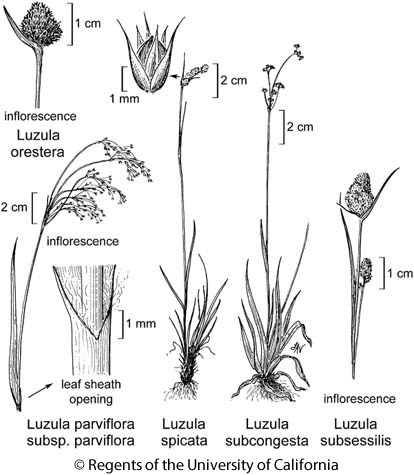 Inflorescence: panicles of 1--few flowers per branch, or head-like and cylindric to ovoid in dense to loose clusters; lower bract leaf-like or herbaceous at base, membranous distally, bractlets 1--3, margins generally ciliate. Flower: perianth parts 6, pale brown to +- black-brown; stamens 6; pistil 1, chamber 1, placenta basal. Fruit: capsule, opening with 3 valves. Seed: 3, elliptic to ovoid, ridged on 1 side, occasionally attached to placenta by tuft of hairs, generally with +- white appendage at tip. Species In Genus: +- 115 species: worldwide. Etymology: (Latin: light; Italian: glow worm) Note: Measure unridged side of seeds; seed length measurement not including appendage. Luzula subcongesta (S. Watson) Jeps. Habit: Plant loosely tufted, 20--40 cm, +- glabrous, +- blue-green; rhizome horizontal. Leaf: flat, tip acute; basal leaves to 10(15) cm, 3--6 mm wide; cauline 3--4, 3--5 cm, 3--6 mm wide. Inflorescence: to 4--6 cm; not nodding; peduncles branched distally, thin, occasionally +- flexuous to arching; clusters 4--20, 3--7-flowered; lower bracts to 1.5 cm, ciliate, herbaceous. Flower: perianth parts 1.7--2.1 mm, equal, lance-ovate, dark brown; anthers 0.3--0.6 mm, filaments 0.5--0.7 mm. Fruit: < perianth, ovoid, tip +- conic; valves 1.6--1.8 mm, dark brown, lustrous. Seed: 1.1--1.2 mm, 0.6 mm wide, narrowly ellipsoid, medium brown; appendage 0. Chromosomes: 2n=24. Citation for this treatment: Jan Kirschner 2012, Luzula subcongesta, in Jepson Flora Project (eds.) Jepson eFlora, http://ucjeps.berkeley.edu/eflora/eflora_display.php?tid=32170, accessed on April 23, 2019. KR, CaRH, SNH. Markers link to CCH specimen records. Yellow markers indicate records that may provide evidence for eFlora range revision or may have georeferencing or identification issues. Purple markers indicate specimens collected from a garden, greenhouse, or other non-wild location.